If you're worried about your Echo Dot becoming self-aware and morphing into a job-stealing killing machine, worry not: That's not happening anytime soon. From Amazon's (AMZN - Get Report) Alexa to Apple's (AMZN - Get Report) Siri, tech companies love to talk up the limitless potential of AI and machine learning to solve all manner of problems, great and small. Salesforce's (CRM - Get Report) Einstein tool, described as an AI layer to its core product suite, offers suggestions to speed up sending emails and other business processes. Facebook (FB - Get Report) CEO Mark Zuckerberg has repeatedly suggested that AI will solve the social network's many issues with data security and abuse. Meanwhile, Alphabet's (GOOGL - Get Report) DeepMind unit -- the result of a $500 million acquisition in 2018 -- has gotten really, really good at board games. But the line between technology, marketing-speak and overactive imaginations isn't always that clear. AI has the potential to excite investors -- some have even speculated that AI businesses could someday be worth five to ten times more than today's consumer Internet companies. There are serious roadblocks to getting there, and one is a shortage of AI expertise. One study from a research firm called Element AI estimated that there are only 22,000 PhD-level AI practitioners worldwide. Top-tier AI talent is so scarce that in the world of tech, individual hires frequently make news. For instance, in early August Apple poached John Giannandrea, a former SVP of engineering at Google, to lead its its AI and machine learning efforts, including Siri. To underscore the significance of the role, Giannandrea is one of just 16 execs who report directly to Apple CEO Tim Cook. Cash-rich tech firms can spend enormously in ramping up AI projects. 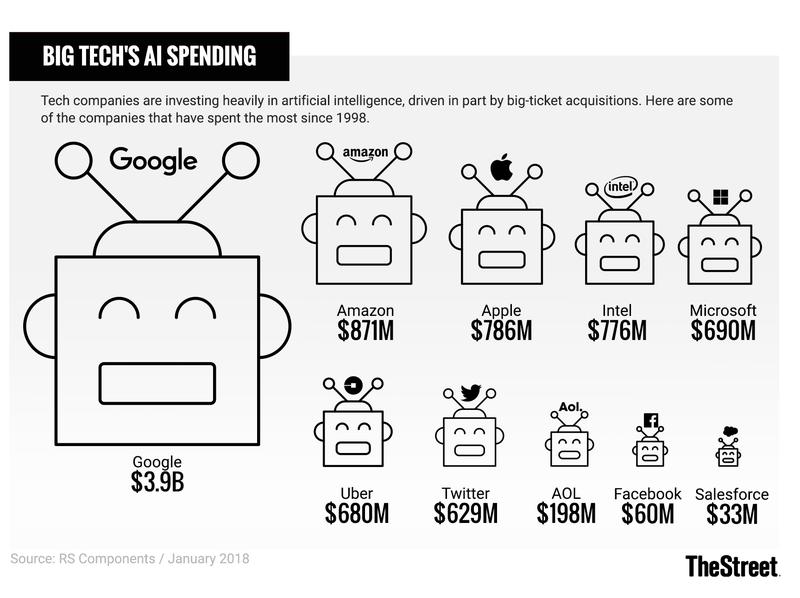 Although the nebulousness of the category makes it impossible to know precisely how much companies are investing in AI, acquisitions are one way of understanding how important a priority it has become at those companies: Alphabet (including Google before it) is the biggest spender historically, dropping an estimated $3.9 billion on AI-focused startups since 1998. Even if you're a company with billions in the bank, there's never enough intelligence to go around. The issue isn't that AI is too new, notes Gerald Penn, professor of computer science at University of Toronto: "What's changed recently about AI, number one, is an awareness of the greater range of tasks that are [in] demand in the marketplace," Penn says. The breakout success of Amazon's Alexa, for instance, has thrust voice assistants into the spotlight -- and even top researchers couldn't have predicted the demands of today's wealthy tech firms. "Going back 20 years, what everyone thought we wanted was to do is make travel reservations -- now pretty much no one is demanding that," Penn added. "It's not just a matter of how many students are being pumped out of universities; it's about whether they can react to changes in technology once they're placed in their jobs." A shortage in AI talent, as well as the massive data sets needed to train, has led to a bumper crop of startups focusing on 'synthetic data': artificially-generated data that can be used for training at tech companies. Yashar Behzadi, founder of one such startup called Neuromation, told TheStreet that demand is growing for fake data. "It's a pretty significant trend," he said. "For instance, Apple published a white paper they used around analysis of FaceID. It's hard to estimate gaze from eyes, and synthetic images helped to improve their overall FaceID system." According to information on LinkedIn, Apple is also building out an internal team focused on the use of synthetic data. It speaks to an inconvenient reality within AI and machine learning: Serious limitations to how quickly the technology can grow -- from a shortage of talent to the labor involved in dealing with large amounts of data -- mean that the AI invasion will be much more incremental than revolutionary. Plus, those sci-fi fantasies of humanlike AI haven't helped much to calibrate expectations, either. "A lot of this has to with how you market these products," Penn added. "[Companies] can give superficial and misleading information about how this technology works, but it leads to wildly inaccurate views of how the technology progresses." So if killer robots keep you up at night, rest easy. If you're an investor betting the farm on AI, not so much.